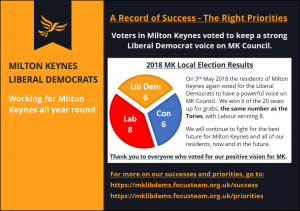 The residents of Milton Keynes have again voted to keep a strong Liberal Democrat voice on Milton Keynes council, working hard for them locally and as a trusted voice on the council, working for the best future for them and their children in MK. 20 seats were up for grabs this year, with the Lib Dems winning 6 seats, the same number as the Tories who won 6, with Labour a little ahead on 8. Added into the seats which weren’t voted for this year the Lib Dems have 12, Labour 21 and Tories 24, with none of the parties now having a majority. This means there will be negotiations about who runs MK council, and with the council split the Lib Dems will be a critical voice for the future of MK. Liberal Democrat councillors and campaigners work all year round, keeping in touch with their local residents with a regular Focus newsletter. 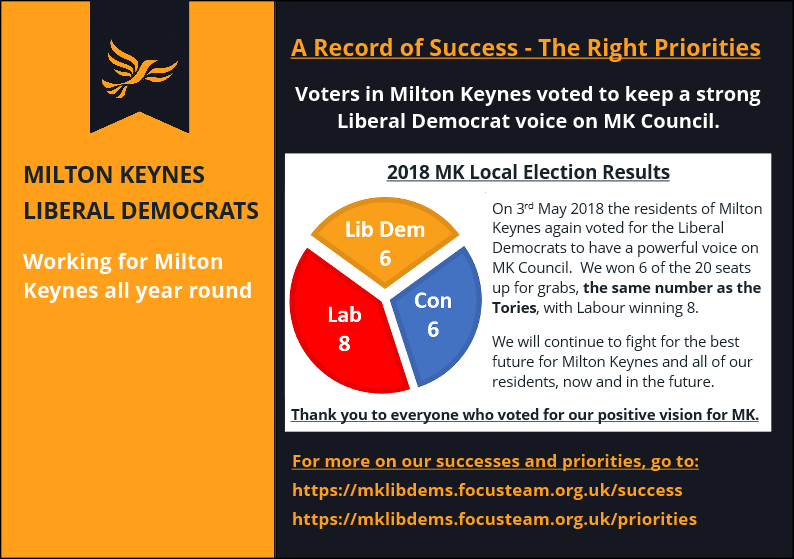 Thank you for everyone who voted for the Liberal Democrats in Milton Keynes on 3rd May 2018 – you are helping to keep a strong Liberal and progressive voice on Milton Keynes council.